Georgia Power’s top executive apologized for the power outage that crippled Atlanta’s airport, saying he realized that it inconvenienced thousands of people. CEO Paul Bowers said in a phone interview Monday that a switch gear failed, causing a fire that then spread to cables coming in from two substations. But he said it wasn’t clear what caused the switch gear to fail. Bowers said failures are very rare, but now that they’ve had one, they have to figure out what to do about it going forward. He said they will look at ways to isolate the switch gear and cables from each other, possibly by encasing one or the other in concrete. He said the fire happened in a service tunnel deep under the airport, so it never posed a danger to anyone. A spokesman for Delta Air Lines says the majority of passengers stranded at the Atlanta airport that lost power have been booked on other flights that will leave Monday. Delta spokesman Michael Thomas said he expected said the airline would be “largely if not completely” back to a normal schedule by Tuesday. That’s well before the peak travel weekend ahead of Christmas Day. Delta is by far the largest carrier at Hartsfield-Jackson Atlanta International Airport, the world’s busiest. The airline canceled 400 flights system-wide on Monday, mostly because pilots and airplanes weren’t in the right places to make all of the runs. Thomas says Delta added roughly 20 flights, booked passengers on empty seats on regular Monday flights, and found places for them on other airlines. It’s a far cry from April, when a massive thunderstorm outbreak grounded Atlanta flights for most of one day. That caused Delta to cancel about 4,000 flights and take five days to fully recover. Airport operations were resuming Monday morning in Atlanta, a day after a crippling power outage left thousands stranded. The ticketing and baggage areas were a bit backed up, but security lines were moving quickly. Most travelers were patient as the world’s busiest airport recovered from the outage. Georgia Power said a fire in an underground electrical facility caused a sudden power outage around 1 p.m. Sunday. That brought the airport to a standstill and grounded more than a thousand flights. The utility thanked people for their patience in a tweet Monday morning and said all essential services were restored and that an investigation into the cause of the outage was ongoing. Thick fog blanketed Atlanta on Monday morning and authorities said that could lead to additional flight delays a day after a power outage crippled the world’s busiest airport. The Federal Aviation Administration tweeted that Atlanta was among the airports where weather conditions might lead to air traffic delays Monday. Georgia Power said a fire in an underground electrical facility caused a sudden power outage around 1 p.m. Sunday. That brought the airport to a standstill and grounded more than a thousand flights, leaving thousands of people stranded. A former U.S. transportation secretary was among the travelers stuck on a plane as a power outage paralyzed Atlanta’s airport, the world’s busiest. Anthony Foxx, who served under former President Barack Obama, tweeted Sunday that he was stuck on a plane for hours. Passengers were being urged Monday morning to check with airlines for flight information as operations resumed in Atlanta following a power outage at the world’s busiest airport. A tweet early Monday from Hartsfield-Jackson Atlanta International Airport said airport concessionaires and the security lines are open. Power was restored around midnight. Atlanta-based Delta Air Lines is the hardest hit airline. In a tweet, the airline urged travelers to use its mobile app or website for booking assistance and updated flight status. Delta was also allowing people traveling to, from or through Atlanta through Tuesday to make a one-time change for no fee. While power has been restored to the world’s busiest airport in Atlanta, the travel woes will linger for days. Thousands of people are stranded Monday morning at Hartsfield-Jackson Atlanta International Airport, where more than 1,000 flights were grounded just days before the start of the Christmas travel rush. Delta, with its biggest hub operation in Atlanta, will be hardest hit. 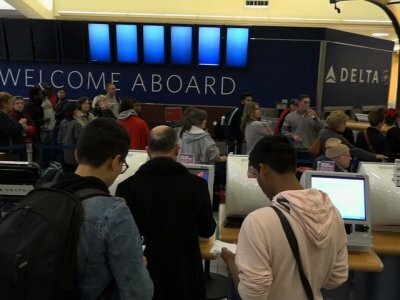 Robert Mann, an aviation consultant and former American Airlines executive, said it likely will be Tuesday before Delta’s operations return to normal, and for passengers “it could be most of the week” because there aren’t many open seats on other flights in the last week before Christmas.